I decided to head to Glenfinnan on the friday night to walk the three Munro’s on the Saturday. Well that was plan A. The weather forecast for Saturday was for blazing sunshine, and not being very good at walking in the sun over long distances, I wasn’t sure I would be able to do the three Munros on the Saturday. So Plan B was hatched. I would walk Gulvain on the Friday night in the cool evening, who was I kidding, and then walk the two Munros easily on the. I got to the car parking area just off the Road to the Isles on the A861 at around 2000hrs. The temperature at the car was still 25 degrees with no wind so this was not going to be the cool evening I had envisaged. I set off with the bike and crossed the road past the small cottage and crossed the bridge. The track was reasonable at this point and continues for just over 2km to cross another bridge and onwards past the old barn. Bye now I was sweating buckets. It was still very hot. It was a lovely evening though with the sun shining brightly on the hilltops. The path is not so good now with a mixture of boulders to cross and small burns running across so the pace is quite slow and after 5.5km I decide to leave the bike and walk. A short while later I reach a fork in the path and stay on the left fork, the larger of the two paths which was a mistake. After half a km or so I realize my error and head directly across the boggy heather and ascend the pathless hillside. 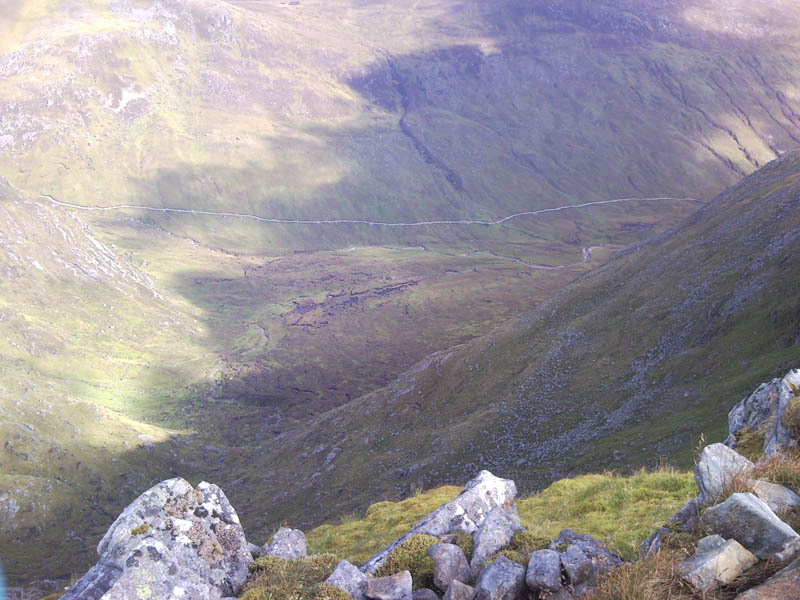 The path in, although a bit rugged, only climbs 80m of ascent so from here it is approximately 880m of ascent to the Munro Top. Its pretty steep but consistent. After ascending 300m or so I am leaking like a sieve and manage to find the regular path meandering up the hillside which makes things slightly easier. I was glad to reach the Munro top as darkness was descending and consumed my bottle of Powerade in one gulp. Its now only 1km to the summit over a nice tight ridge dropping and climbing 100m or so. Its now going to be a walk in the dark so on with the head torch and retrace my steps. 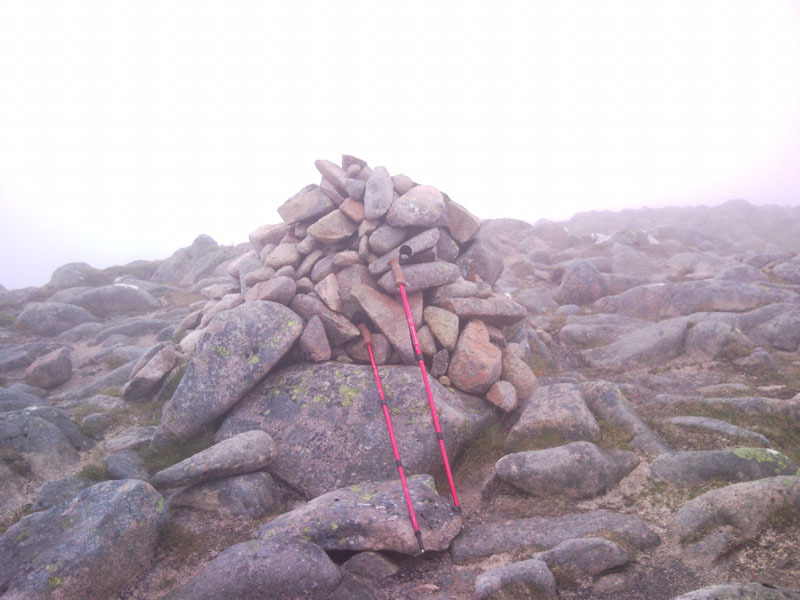 I reach the Munro Top and take a bearing I have gps with me but It does go wrong on occasion so better to be safe. The path disappears as I head down the rocky terrain and I head slightly of my bearing. The GPS indicates that path is 200m or so to my right but as much as I contour over I don’t fully believe it hahaha. I can only see a few meters in front of me but this hillside presents no issues with no crags or cliffs on this side and I am soon at the base of the hill and back on the path. I get to the bike and its an absolute crawl cycling back out due to the terrain and the dark. I get back to the car and feel good. However I have sweated as if I was in a sauna for hours and lost a lot of salts and minerals which was to have a devastating impact on my walk on Saturday. After last nights walk I got back to the car and refuelled with pasta, mars bars, biscuits and coffee. I then retired at about 0100hrs but probably due to the coffee and cramming loads of food in I could not get to sleep. The last time I remember was 0500hrs and then next thing the alarm was going of at 0830hrs. I had some flapjack, banana, apple and chocolate for breakfast and drove the 7kms or so to the car park just past the Glenfinnan visitors centre. I met Theresa, Johnny and Kim here. They were going in to walk Streap. I told them my plans and added that with the cycle in and out it should only take 5 or 6 hours. Oh was I sadly mistaken hahaha. They imagined it would take them the same so I should catch them later. So 0940hrs and I am cycling up the good road. This is tarmac all the way to Corryyhully Bothy and although cycling at a leisurely pace it takes no time to get to the bothy. Again I was sweating buckets. It was very hot and was only going to get hotter I feared. I had two bottles of Powereade and one bottle of water with me and duly drunk three quarters of one at the Bothy. The cycle in only ascends 50m so there is a climb of 900m to the summit. I left the bike here propped up against a tree and followed the path onwards as it meanders along. The path bends as it crosses the river and then just after a small Copse a small sign indicates the path into the hillside for the climb up Sgurr Thuilm. I get to about 350m and I feel drained of energy. I have to stop every so often and rest. I get to 800m and have to consider sacking it and walking back down. I am in a terrible state. I have a banana and some trail mix and more Powerade but as I find out later my digestion has shut down with the effort and all my energy is focussed on keeping moving. 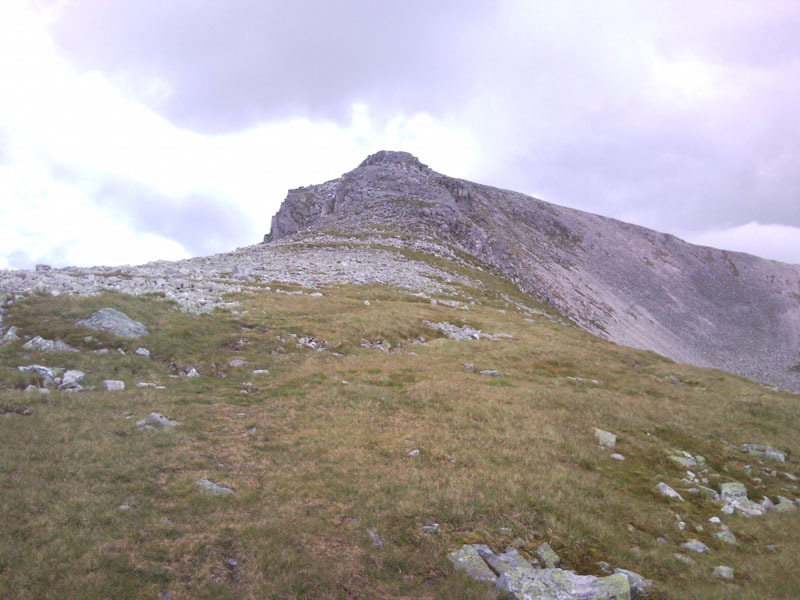 I get to the easier slope of Druim Coire a Bheithe and continue to just below the summit but I have to stop. Again I am tempted to pack it in for the day. I decide to lay down in the grass and set my alarm for 15 minutes. The time passes all too soon and a walker returning from the summit passes me. After a quick chat he is on his way and I am struggling on mine. After what seems like an eternity I reach the summit. The sun is blazing down and the views all around are superb. It has taken me two hours to climb the final 2.3km ascending 600m. There are two small cairns here so I visit them both. I look across the undulating ridgeline to the summit of Sgurr nan Coireachan approximately 4kms in the distance. It’s a combined ascent of only 400m yet I don’t think I have the strength to do it. I can go back down now, only 3km back to the bothy and the easy cycle out. I stop for 20 minutes to add more fuel that won’t be digested to my bloated stomach. My body is telling me not to eat because it knows it will just sit there but my mind wants fuel. I drink the rest of my Powerade. I text Danny and tell him how I feel. He replies “Slow up and see what you can do”. I can’t go any slower hahaha. Next he replies “Stop your moaning and get the job done”. After 20 minutes on the summit I retrace my steps back down the hillside to the line of fence posts heading off to Sgurr nan Coireachan. I go past the fence post then stop and look over. Damn it I have to do it. So back to the fence posts and onwards up and down Beinn Ghardh and Meall an Tarmachain and onto the final climb up to Sgurr nan Coireachan. I have to stop a number of times and have my 15 minutes lie downs. Two hours later I am on the summit of Beinn Ghardh and Meall an Tarmachain and onto the final climb up to Sgurr nan Coireachan. 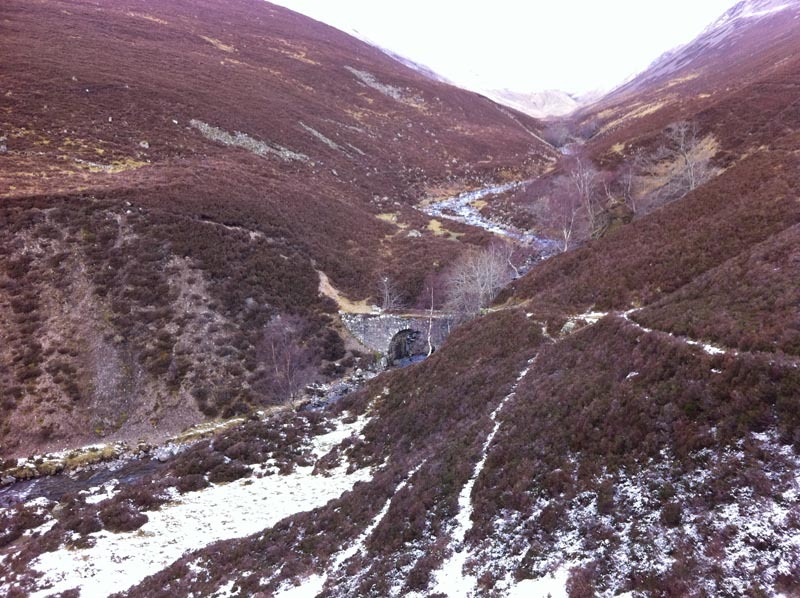 Its now a 3km descent to the Bothy. I have no fluids left either in the bottles or in my body. I fill up from a stagnant pool and put a Puritab in so in 15 minutes I will have something to drink. I am looking for running water all the way down the hillside but the only streams I see are too far away. Approximately 30 minutes later I get a message. Its Theresa. They are on the way out and are at my bike. She is concerned about me. I am concerned about me hahaha. I text back telling her my legs have stopped working and I have no energy. I am halfway back down and will be ok. I thanked her for the message it was a boost. It takes me 1.5 hours to get back down to the path. I have drunk the bottled water and am very thirsty. As luck would have it there is a raging waterfall by the path and I jump in and have a big drink. I feel the cold water coursing over my body bringing me to life again. I need another rest and sit down beside the water for 15 minutes. Then I am sick. Numerous times. It would seem like all the food, banana, trail mix etc all came back up. Maybe nothing was digested. Another drink and I am on my way. In no time I reach the bike and the bothy. There is a guy at the bothy, William. He can see I am not so good and makes me a cup of tea whilst I rest. 15 minutes later I head off but after walking 10m I am sick again. I go back to the bothy and lie down inside for what seems like 10 minutes but is in fact 1 hour or so. I get up and William says I could stay the night. There is a fire going and he has food. I thank him but really need to get back. There is no way I can drive to Braemar now. Sorry guys. I walk the 20m to the road and cycle back to the van. The cycle out is rapid and only takes 20 minutes. Its now 1900hrs. I am burst in a big way. I don’t eat but for the next few hours I drink little bits at a time. Then sleep. At 0400hrs I eat food. And then more sleep. That was the toughest day I have had in a long time.